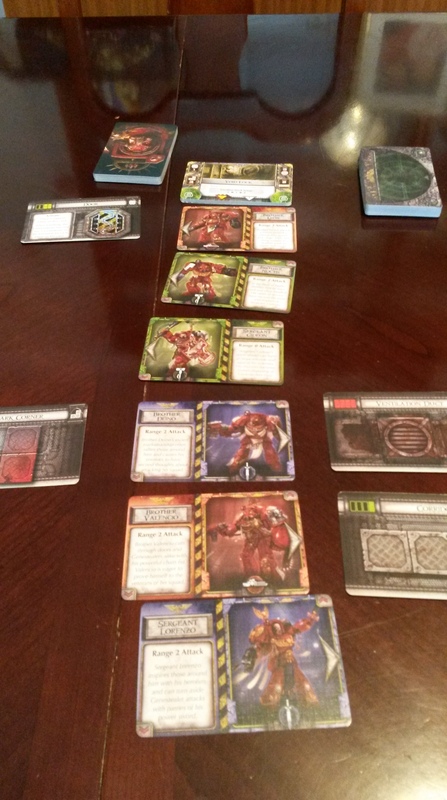 Space Hulk: Death Angel – The Card Game is set in the world of Warhammer 40k. It’s designed by Corey Konieczka and published by Fantasy Flight Games. It’s a co-op game in which you take command of a number of space marine squads as you try to make your way through different locations, battling aliens all the way. The game can be played from 1-6 but I’ve mostly played it solo, so I’ll be talking about it from that perspective. First I’ll give a brief overview of the rules, although by no means is it an extensive look, and then I’ll talk about my opinion. This is the typical layout of the game. The location is at the top of the line of marines, and it will tell you which terrain cards to put out (things like a door, corridor etc). It also tells you how many Genestealers (aliens) are in the location, and these are formed in blip piles. When one blip pile is empty you travel to the next location, and to win the game you have to fulfil the objective of the final location. On your turn there are a few different phases, which are outlined in the rulebook. Each player chooses actions. You have a number of action cards corresponding to your marines. There are three types – move & activate, support, and attack. 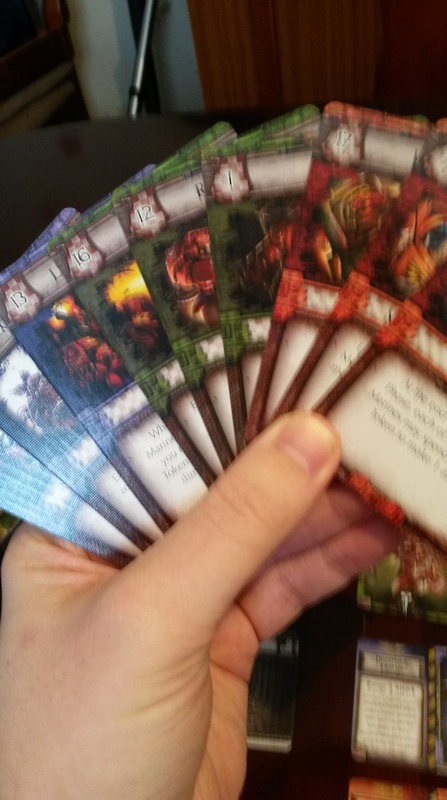 You can only play one action per team (both marines do the action) and you cannot use an action twice in a row (for example if red attacks this turn they cannot attack next turn). The cards have numerical values and they’re resolved from lowest to highest. After these have been resolved, the Genestealers attack, and you keep doing this until either you win the game or, more likely, all the marines die in a horrific, bloody slaughter. The game also comes with these things. The circular tokens correspond to each team, and I use these to mark which action I’m taking, to make it clear what I can and cannot use in the next round. 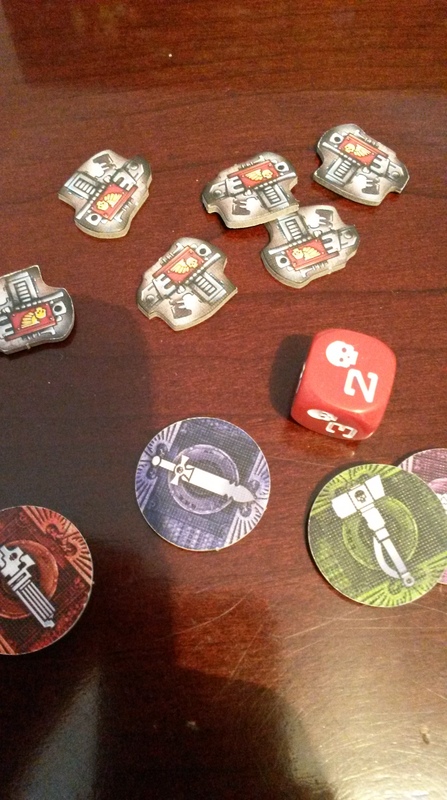 The little guns are support tokens, and these are mostly used to re-roll the die when either attacking or being attacked. And then there’s the die. Oh that damn, dastardly die. In combat you roll, when attacking if you get a skull then the alien you attack is dead. When defending you have to do roll higher than the number of aliens in the pile that are attacking you in order to survive. the die goes from 0 – 5 and you will begin to hate that 0. There’s some other stuff going on, like there are event decks that are usually horrible things, and different terrain cards do different things, but that’s the basic game. I mean, it can be brutally hard, but it’s really fun. I love how you have to plan your actions thinking ahead to the next turn. You might want to attack this turn, but you know that some more aliens are going to be coming next turn and you won’t be able to deal with them. It’s kinda puzzly in a way because the marines all have a facing and a range, and they can only attack in the direction they’re facing (and if they’re attacked from behind they won’t be able to re-roll a die when defending), so you have to figure out where you want everyone in the formation. Each team has two members, one of which will have a cool ability (like one guy can keep attacking as long as he rolls skulls) and the other is just, well, cannon fodder basically, so you want your cool people where they can be used, but you also need to be careful not to put them into harm’s way. But as much as you strategise and plan, the event decks and the roll of the die can scupper everything. Some people won’t like these random elements but I think they add to the game and make victory, when it comes, all the sweeter. I’ve played this a number of times and have only won once, and that was by the skin of my teeth. I like how the terrain changes based on the location, and how each game you randomly select the locations. This adds a great deal of replayability to the game, and you can also play with different teams. The artwork is great, the components are cool and really it’s amazing how much game there is in this little box. The big negative about the game is the rulebook. It’s actually a straightforward game but the rules aren’t laid out well and there are a few little things that aren’t clarified properly. Aside from that though I think the game is great. Yes, it can be annoying when you plan out your next turn, then roll a 0 and suddenly your guy is dead, but it offers a good challenge. I like the variety in the game, and I love the process of choosing your actions. There are a number of tough decisions you have to make, and when they come off it’s an amazing feeling. I’ve only had this game for a short time but already I love it. It’s portable and it’s great to just bust out for a quick solo game. With more players you include different location cards, so I’d be eager to try them but as a solo game it’s brilliant and great value for money. 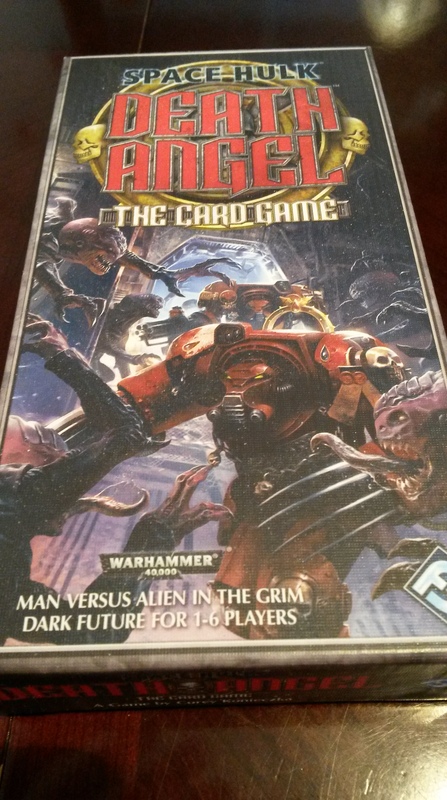 I’m not even into the Warhammer universe but the theme of moving through and fighting aliens is cool, so I highly recommend this one. It always surprises me when I read other peoples’ reviews of this game, because it seems to be one of those that, while really, really difficult, still manages to remain enjoyable! I think because it’s so easy to set up! And easy to carry around as well. And I think even though it’s difficult it never feels impossible, you’re always like well, if that die roll had just gone my way, or if I had changed that guy’s facing…it’s a game made up of lots of small factors. Yeah, it’s one of those that, even when you lose, you feel like you could have won “if only”! Definitely +1 for portability too!